This is a classics and very common bread for Breakfast. This bread is little sweet, soft in the inside and crunchy outside. I made this bread without Egg & butter in a healthy way. This is a very tasty bread too. This bread can be eaten as it is or Spreads can be applied to enhance the taste of the Bread. Butter, Margarine OR cream cheese will go best with this bread. This is a classic and very common bread for Breakfast. This bread is little sweet, soft in the inside and crunchy outside. Take a large glass bowl and add 3 cups All Purpose Flour, Brown Sugar, Dry Active Yeast, Baking Soda, Baking Powder, Dry Milk Powder and mix well by using your hand. 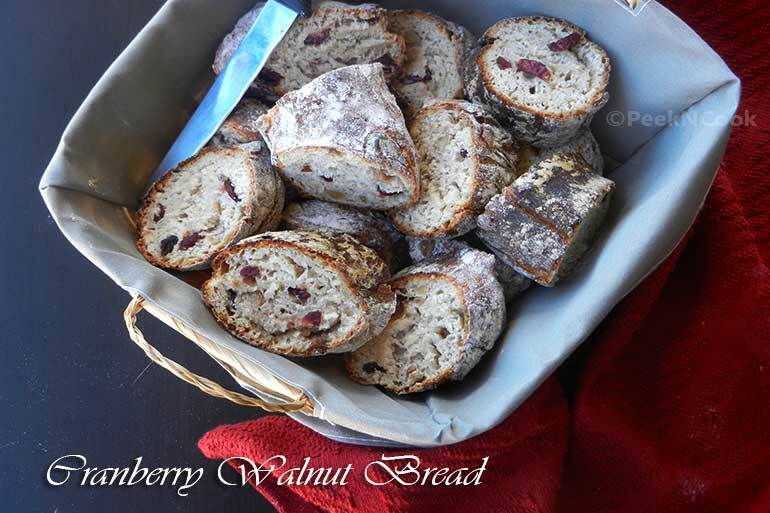 Now Add Cranberries, Chopped Walnut, and the Very Warm Water to the Mixture and make a very soft dough with your hand. Apply the Vegetable Oil or Canola Oil all over the dough and cover the Bowl with a Plastic Warp and place inside the Microwave/Oven to raise the dough for 2 hours double in the size. (Do not turn on the Oven Or Microwave). After 2 hours bring out the dough and kneed lightly. Now take a loaf pan or Bundt Cake Pan and shape the Dough inside the pan and wrap with Clean Plastic and leave for another 1 hour in a dry place. Now Unwrap the Loaf pan Or Bundt Cake Pan , dust the dry All Purpose Flour over the Dough and place the pan inside the pre-heated oven. For loaf pan the baking time will be 40-45 minutes. For the Bundt cake pan baking time will be 25-35 minutes. After the baking remove the pan and let the pan cool down for 15 minutes. After 15 minutes bring the Bread Out from the Pan, Slice and serve.